That was an unplanned absence! I just got busy, and didn't have much of an urge to write until today. Besides, it seems like half the world is off on holiday right now. I wish I was still on holiday! I'm pining for the seashore, and I know it will be a long time before I can go back. As a bit of nostalgia, here's a photo from our honeymoon last fall. I have been busy knitting and working on patterns. This set of cuties is awaiting just one more member. 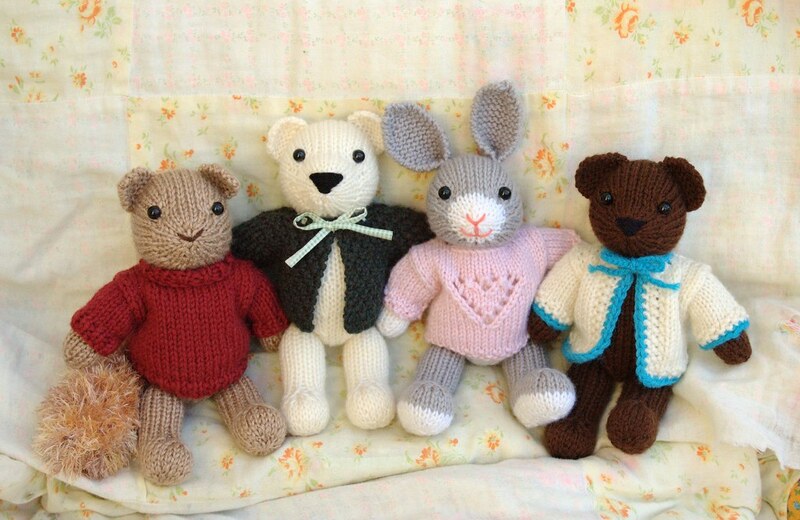 They're all going to a friend's mom, who wants them to give away as baby gifts. I hope whatever new moms and babies get them will love them to bits! 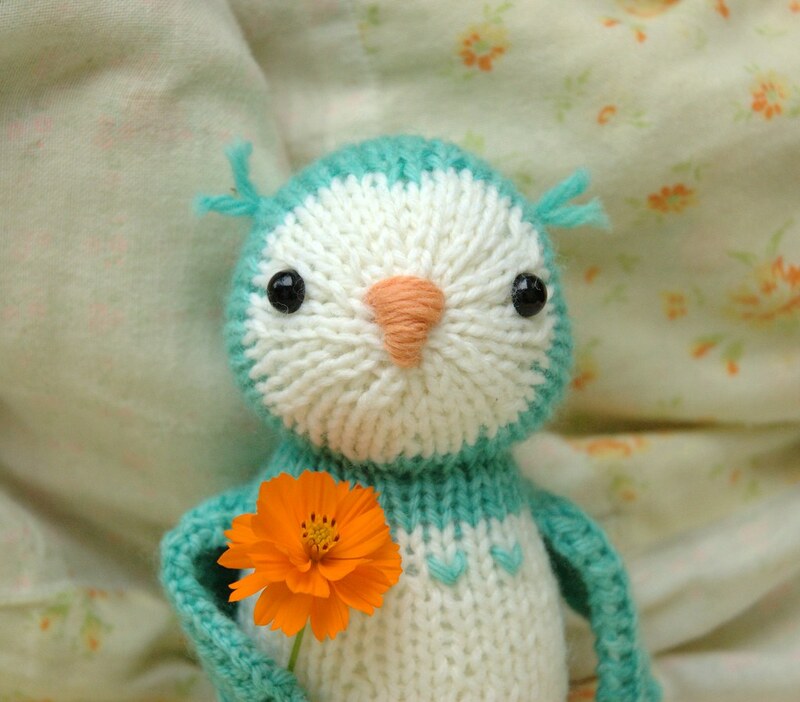 I also knit up Owen, a super cute little owl for my friend who's moving back to Portland soon. We'll all miss her crazy sense of humour, her bizarre and funny stories. I have some great vidoes from our all-night retro girly sleepover last weekend, some of which are for mature audiences only! I've been too lazy to edit them yet, but I might put one or two of the cleaner ones on flickr. It was a lot of fun, and reminded me of summer camps as a girl guide. Oh nostalgia! It's been an up and down kind of week. I got some good work done, had an awesome visit with my girlfriends, and enjoyed the cool, wet weather. On the down side, my morning sickness medication ran out this week. I gave myself a couple days to see if it was passed, but sadly not. I've been pretty sick again the last 2 days, so today I broke down and went to the pharmacy. I love my pharmacist, he's so nice and reassuring. I get the feeling that he's a recent dad, and understands what I'm going through. Anyway, I have another fun date planned with my friends this weekend, and I'm so glad I can now enjoy myself! It looks like my husband's great idea about Lulu didn't pan out. Probably too much to hope for that they would have done things the efficient way. I'm not a web programmer, but I can sometimes still see the way something should be done, but maybe it's too complicated for some reason. Finally, I'll share with you these two sweetie pies made by Pat. 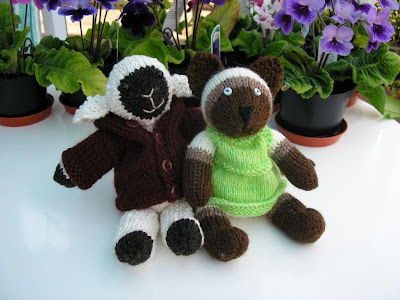 The kitty is wearing a dress made from some of my hand-dyed yarn, and the lamb was made from one of my kits. It's so fun to see my ideas turn into cute toys, through someone else's hands. My husband brought up an interesting idea about my post yesterday, but I need your help to check it. He thinks that if you've bought patterns from Lulu, you should be able to go back and download the new versions when I update them. I can't check this myself, but it makes sense to me. So if you could help me out, that would be great! For example, if you bought the Sea Horse pattern the first day it was available, you could see if a newly downloaded version still has the spelling mistake, or if you get the corrected version. If this works, it means you could get the new versions of patterns as I update them. Sadly, I can't do the same thing with Etsy. Just thinking about trying to replace old patterns, checking all the orders etc, makes me feel a little faint :) It would be nice if Etsy could come up with a better way for people to sell pdf patterns, but at least I have Lulu as a backup. It's been ages since I shared a recipe with you, so here is my favourite recipe for blueberry muffins. In it's original version, it came from a Company's Coming book, not necessarily the first place you'd think to look for a great recipe, but there are a few hiding in them. Butter tastes better of course, but the oil works fine too. Freezing the berries first will help them hold together when mixing the batter. In a large bowl, combine the flours, b.p. and salt. Make a well in the centre. In another bowl, mix the butter/oil and sugar. Beat in egg. Mix in milk and vanilla. Prep your muffin tins (this makes 1 doz. medium muffins) by greasing or using paper liners. Set the oven to 400 F (200 C). Pour the wet ingredients into the dry, and add the berries. Stir gently until the batter is evenly moist. Spoon into the tins, about 3/4 full per muffin cup. Bake for 20-25 minutes, or until golden brown. Muffins are always best hot from the oven, but these will keep well if you freeze them as soon as they're cool. Then you just warm them up, or stick them in your lunch bag and they'll be thawed by lunch time! Well, the poll still has half a week to go, but the results seem pretty obvious. I'm glad you all like the idea of combining the bunny patterns. Simpler for me, and better value for you. I might do the same thing with the monkey patterns, the next time I have a new pattern ready. I'm hoping to have the next one done for the beginning of September, but that will only happen if I work very hard next month. I have a couple of important projects I need to get done, at the same time as working on the new pattern. You might also notice I added a new clothing bundle (Bundle I) to my Etsy shop. It's actually one that had been in my Lulu shop for a while, and we finally got the new version done so I could more easily sell it on Etsy (the original one was four separate files). But silly me, I wanted to change one of the patterns in the original (the cape) because it was in the super-cute bundle, but picked a pattern that was also in that one (the hooded cardigan)! Okay, I know I should have checked, but I was trying to do this when I was at my most sick and exhausted. Anyway, the new bundle will soon be changed to have the sailor shirt instead of the hooded cardigan. The super-cute bundle (renamed Bundle II) will still have the hooded cardi, and I might throw in the hooded cape too, since I don't have that pattern anywhere right now. But my husband probably won't have time to update it until next week. Is all that confusing enough? Now I get to spend an exciting day editing patterns! Woo hoo! Can you tell I'm just here procrastinating? I've been thinking of a few little changes to my Etsy shop. I like to keep the number of toy patterns at 20, because if it gets too much above that, it's a lot of work keeping track of which ones are sold out. As well, some of my patterns just don't sell very well. I do keep all my patterns for sale at my Lulu shop, because that one mostly takes care of itself. So, one change I was thinking of making is to combine all three bunny patterns into one bundle. It always seemed silly to me to have three different ones, when really the only difference is the outfits. But while I didn't have so many patterns, it made sense to offer my customers more choices. So the proposed new pattern would have the bunny, with long and short ear options, and three outfits: the pinafore dress, the hoodie, and the jacket and waistcoat. I would probably sell it for $5.75, like the clothing bundles. I've put up a poll, so you can vote, or leave a comment with your opinion. I suppose another option would be to include the super cape and t-shirt, instead of the hoodie. The other possible change would be to remove a couple of toy patterns from my Etsy shop, whichever 2 have the lowest sales. I think this would be the koala and either the cow boy or the puppy. However, I would hate to get rid of any of those while still having 3 bunny patterns. Anyway, let me know what you think. Also, I want to announce that we've decided to lower the price of the Fuzzy Knits book. I know that people who order the printed version also have to pay quite a bit in shipping, so hopefully this lower price will make the book affordable for more people. This also means that the wholesale price for yarn shops has decreased a bit. Today is a usual quiet and lazy Saturday. We popped down to the farmers market and picked up a bunch of organic veggies: zucchini, eggplant, cauliflower, broccoli, and some sugar-snap peas (already nearly all gone!). We also found some sausages from a nice farmer who raises antibiotic-free animals, and I picked up a bar of home-made soap as a little treat. Doesn't sound too bad, eh? Our farmers market is actually very small, but we make the best of it. Some of you may have noticed a wee spelling mistake in the Measurements section of the Sea Horse pattern. Just one letter, and see how silly I look! On the bright side, it wasn't my mistake! I had never bothered to include the finished measurements for the shirt in the pattern draft, and my husband wrote it in as he was finishing up the formatting for the final pattern. We both apologize for the potty language, which was unintentional, although funny. Hopefully that is the only problem with the pattern. Okay, back to work for the day! 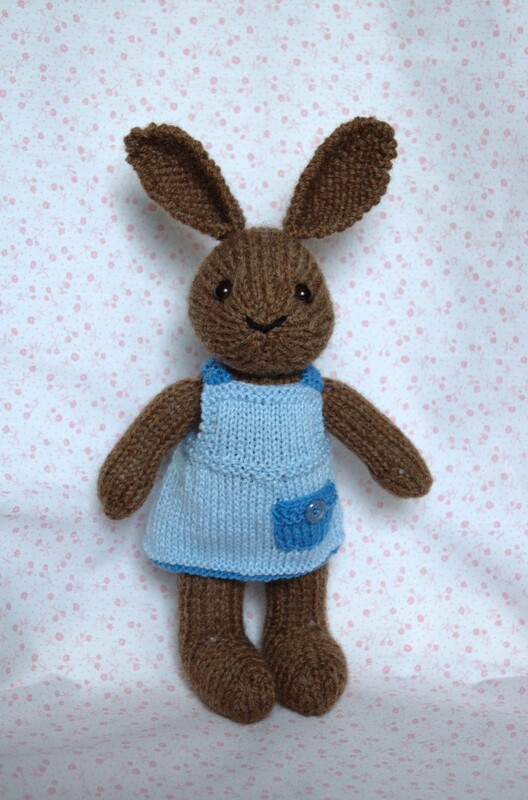 For the knitting: I quickly knit up this little cutie over the weekend. It's a special gift for a boy who recently lost his mom. I've been told he already has several of my toys, but really wanted a squirrel to complete the set. The request was made a while ago, and I felt bad for putting it off, but I really only had time (and was feeling well enough) to get it done now. The sweater is one I knit from some of my hand-dyed yarn a while ago, but it never suited any of my toys until now. I'm sure this little squirrel will find lots of love where it's going. And the goats :) Goat's milk actually. Cow's milk and associated products were giving me lots of trouble with indigestion (on top of morning sickness), despite the fact that I've been eating and enjoying them all my life. But pregnancy does weird things to your body. So I thought I would try switching to goat's milk, and see how that went. The cheese I like, and the taste is far more appetizing that cow's cheese right now. Goat's milk... not so much enjoying the aftertaste. I remember trying it as a kid and not liking it, but wanted it to give it another go. I ended up using most of the carton in some raspberry muffins, but still have to stop myself from imaging a faint taste of goat. Oh well, maybe soy milk, or that lactose-free stuff will be better. Anyone have a better suggestion? Well, really we got home early Wednesday morning, but that day was for recuperating from the long drive and over-night flight. Yesterday was for taking care of important errands. So today you get the blog post! I know I meant to write a post or two while I was away, but I was really enjoying my family's company, and also enjoying ignoring my online life. Sometimes a break makes it all seem interesting and worthwhile again. I've slowly been catching up on some of my blog reading, but I think it will be another week before I get to everything. I thought most people took a break during the summer? Anyway, once my hubbie gets the photos all done, I'll show you what we were up to. I also need to seriously think of getting back into knitting. I promised a squirrel to a little boy a while ago that I really should get done soon. Then I have a big important project to do, which is really exciting, and I can't tell you about yet. I know this bugs you all, but I promise to spill the beans once I'm allowed. Then I need to finish off a couple of toys to finish a set of five I've been working on for a while. I also keeping thinking of offering a few commissions for toys through my Etsy shop, but every time I clear my plate and am ready to go, something new comes up that I can't say no to. I really want to move on to mostly designing, and only make a few toys for sale when I feel like it, but I need to get better at saying no before that can happen. And you know, I'd love some time to knit for myself! I bought some gorgeous yarn while on holiday, super-soft baby llama from Peru, in a rich heathery teal with some cream for contrast edging. I want to spend some time on Ravelry looking for the perfect pattern, but I just know that little voice in me head will be saying, "shouldn't you be working?"